PrintJet Inks’ technology and manufacturing facility is the core of our business. Our on-site lab enables us to design and manufacture inks and fluids for the most difficult customer applications. Require less printhead maintenance which means less downtime on your production lines. Use a 4-stage filtration process that ensures no sediment, sludge or residue. Provide rapid drying, usually 100 micro-seconds to 2 seconds, depending on surface. Trouble-free conversion with our replacement inks and make-up fluids for OEM coders. Use only the highest quality dyes, pigments and materials. PrintJet fluids improve your printers performance with enhanced print quality and less maintenance to provide a substantial savings for you. Quality fluids at economical prices that are designed and manufactured by PrintJet Inks. 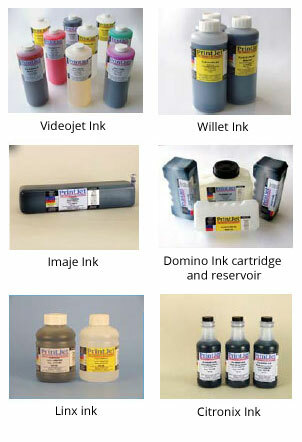 PrintJet Inks offers a complete line of Drop-on-Demand (DOD), Hi-Res and Continuous Ink Jet (CIJ) Inks and Makeup Fluids. At PrintJet Inks We Value All of Our Customers Large and Small! Our Distribution Specialists Ship Daily From 1 Carton Within the United States to Ocean Containers World Wide! At PrintJet, we pride ourselves on being able to provide our customers with a total solution for coding equipment, supplies and spare parts, while providing the most economical cost per code possible. Custom applications are our specialty. We will work with you to design a system of inks and coding equipment which best suits your needs. General Purpose M.E.K., Ethanol, and Methanol Inks in Black, Magenta, Blue, Violet and Others. Returnable Glass Inks/Washable Inks For "Special Applications"
Besides PrintJet Inks extensive Product Line our on-site labratory and manufacturing facility enables us to provide customers with specialty inks for every application. PrintJet Inks are always researching and developing new and better inks for CIJ, DOD and Hi Res printers. Coding requirements change constantly as original equipment manufactures introduce new coders into the market -- PrintJet Inks is continuously working to develop the widest range of inks for every possible coder and substrate. Our goal is to offer inks that provide dark black or vibrant color codes while offering optimum dry times at an economical cost per code for all printers.